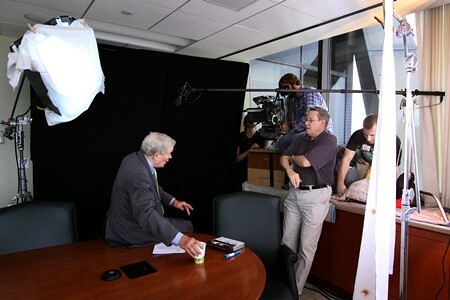 “Envisioning Home” director Daniel Blake Smith interviews Senator Kit Bond in Thompson Coburn’s St. Louis office in April 2012. The film premiered at the St. Louis Film Festival on Nov. 14. A feature-length documentary about affordable housing premiered at the St. Louis International Film Festival this week and featured commentary from Thompson Coburn partner and former U.S. Senator Kit Bond. The film, “Envisioning Home,” centers on two leaders who, starting in the 1970s, redefined St. Louis’ approach to affordable housing. Richard Baron, the founder of developer McCormack Baron Salazar, and Jean King, a St. Louis housing activist, worked together to dramatically improve the housing outlook for low-income St. Louisans. The film’s Emmy-nominated producer, Daniel Blake Smith, and his crew traveled to Thompson Coburn’s St. Louis offices in April to film the interview with Bond. Bond spoke to the filmmakers about his personal connection to Baron, the devastating state of public housing in the U.S. in the 60s and 70s, and his own work on HOPE VI, or Housing Opportunities for People Everywhere. The HOPE VI program served a vital role in the Department of Housing and Urban Development’s efforts to transform public housing in America.